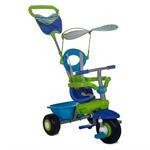 Smart Trike 3 in 1 is based on "Gold award" winning trike. 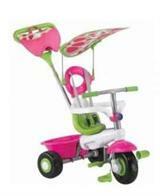 This tricycle for toddlers features a canopy, non slip pedals, and a parent steering handle. When Parents are steering the Smart Trike it has a press out clutch to prevent injury, also a safety bar to prevent child from falling. Smart Trike 3in 1 is designed with a antiroll-over feature for your child's safety. Geared towards children 10 months to 36 months.